(Tribune Media Services) -- If San Francisco had a sister, it would be Lisbon. Both cities have twin bridges and famously foggy weather. Both are situated on the best natural harbors on the west coast of their respective continents. Both have trolleys rattling up and down their steep hills past characteristic buildings. And both have survived horrific earthquakes. In 1755, an estimated 9.0 earthquake leveled two-thirds of Lisbon. Within a month, a new city was designed, and downtown Lisbon was rebuilt on a progressive grid plan, with broad boulevards and square squares. Today, Lisbon is a ramshackle but charming mix of now and then. Bird-stained statues mark grand squares, taxis screech around cobbled corners, and well-worn people hang out in Art Nouveau cafes. And just like it did during the days of Magellan and Vasco da Gama, the city continues to welcome ships to its large port. Even today, Lisbon still feels like Europe's gateway to the world. 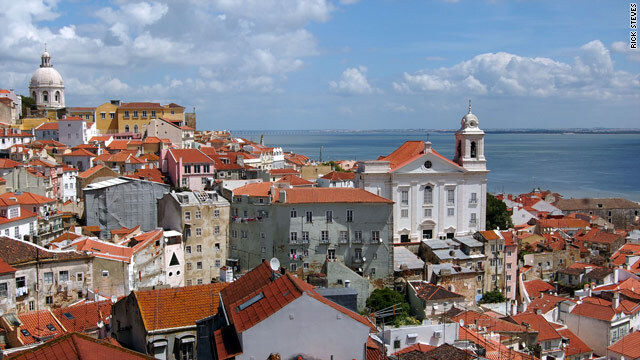 Tumbling down from the castle to the river, the Alfama is Lisbon's salty sailors' quarter. Its tangled street plan is one of the few aspects of Lisbon to survive the big quake, making the Alfama a cobbled playground of Old World color. Urban-jungle roads are squeezed into a maze of confusing alleys, designed to frustrate invaders trying to get up to the castle. What was defensive then is atmospheric now. Bent houses comfort each other in their romantic shabbiness. The air drips with laundry and the smell of clams and raw fish. When I came here in the '70s, the Alfama was one of the places that charmed me into becoming a travel writer. On my last trip here -- 30-something years later -- I noticed that much of the neighborhood's grittiness has been cleaned up. Immigrant laborers have replaced old fishermen's families. Once-characteristic fish stalls have moved off the streets and into "more hygienic" covered shops. Widows no longer wear black after their husbands die. Despite modernization, the Alfama remains one of the most photogenic neighborhoods in all of Europe. Three miles from downtown, Belem is a stately pincushion of important sights from the days when Portugal was Europe's richest power. Following the quake, Portugal's rattled royalty chose to live out here, in wooden rather than stone buildings. The royal stables now house the National Coach Museum, displaying 70 dazzling carriages in an elegant old riding room. The oldest coach dates back to 1600, originally used by King Philip II to shuttle between Madrid and Lisbon. You'll have to trust me on this, but if you lift up the seat cushion, you'll find a potty hole -- also handy for road sickness. Nearby, the Monastery of Jeronimos houses Lisbon's most impressive church. This is where seafarers such as Vasco da Gama prayed before embarking on their voyages. The church is one of my favorite examples of Manueline architecture, an ornate, uniquely Portuguese style featuring an airy interior, slender palm tree-like columns, and motifs from the sea, including shells, artichokes (eaten for vitamin C to fight scurvy), and monsters representing the mystery of undiscovered lands. Across the street, the gleaming Monument to the Discoveries celebrates Prince Henry the Navigator and offers great views of Lisbon and the Tejo River. Inside the monument, view a fun Lisbon Experience video, and before leaving Belem, try a tasty pastel de Belem, a wonderful cream tart invented in this neighborhood. The more modern-feeling Baixa is the rebuilt center of Lisbon. This flat shopping area features grid-patterned streets and utilitarian architecture (buildings are uniform, with the same number of floors and similar facades). The Baixa's pedestrian streets, inviting cafes, bustling shops, and elegant old storefronts give the district a certain magnetism. I find myself doing laps up and down the pedestrians-only main boulevard in a people-watching stupor. The neighborhood is also home to the oldest ginjinha joint in town. Served in shot glasses, this popular drink is made from the sour cherry-like ginja berry, sugar, and grappa. (When locals are impressed by the taste of something, they say, "Sabe melhor que nem ginjas" -- "It tastes even better than ginja."). A shot of ginjinha is especially nice if you ask for it gelada (poured from a chilled bottle). For more liquid sightseeing, the Port Wine Institute (a funicular ride away from the Baixa) has a menu of 300 different ports. As for me, I'm not choosy: "any port in a storm." Whenever I go to a bar in Lisbon, I eat pastel de bacalhau, a fried potato-and-cod croquet. Bacalhau (salted cod) is Portugal's national dish. Imported from Norway, it's never fresh, and kids think it's a triangular fish because of the way it's sold. I think that Portugal must have the only national dish that's imported from far away -- strange, and yet befitting of such a distinctive place in the world. COPYRIGHT 2010 RICK STEVES, DISTRIBUTED BY TRIBUNE MEDIA SERVICES, INC.